Is it true that there will be a solar storm in December (2014) and there will be three days of darkness? If so, why is this happening? Well, thanks a lot for your question Pablo. Let me first start by clearing the air and respond directly to the question: No, it is not true that there will be a solar storm that will cause three days of darkness. So there you go! I think this is a rumor that has been going around the interwebs for quite some time. Neither NASA nor any other respected scientific institution has made such a claim. Joules. Solar flares are sometimes followed by the ejection of plasma from the upper atmosphere of the Sun (called solar wind) and accompanying magnetic fields. The particles that make up the solar wind (electrons, ions and atoms) reach the Earth one or two days after the event. Incidentally, the charged particles hitting the magnetosphere are the reason for beautiful auroras! 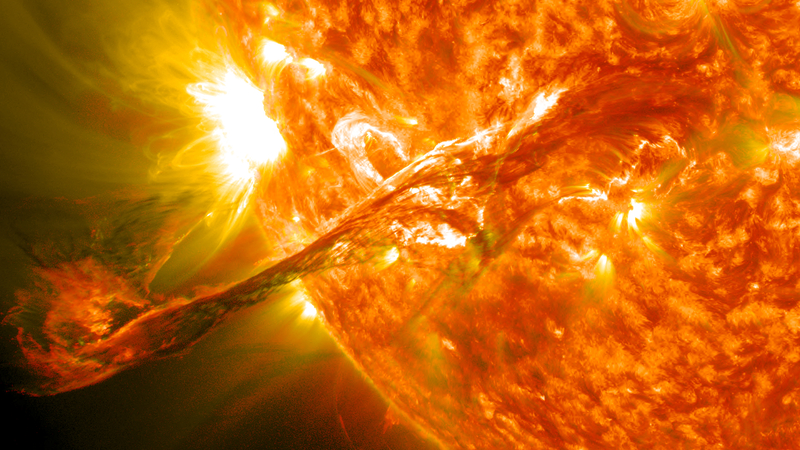 As you can imagine, solar flares have a definite impact on space weather locally, and thus on the Earth too. The particles from the solar wind can impact with the Earths magnetosphere and present some hazard to spacecraft and satellites and in some cases affect the terrestrial electric power grids. One of the most powerful solar flares observed was recorded in 1859 by Richard Carrington and, independently, Richard Hodgson and the auroras could be seen even in Cuba and Hawaii! The Sun’s magnetic activity has been observed to follow a periodic cycle of about 11 years and on a maximum there are more solar flares. The last maximum was in 2000 and we were thus expecting a maximum around 2011, but as with other weather (terrestrial or not) predictions, there is a margin of error. So, I am sure you can go around doing your end of year celebrations without worrying about solar flares and who knows you may even have a chance to see a charming aurora! If you want to ask a question to Quantum Tunnel use the form here.